Clifford Odets’ drama Awake and Sing, a classic of the American social realist genre that deals with Americanized Jewish immigrants in New York in the 1930s, opens at the Quintessence Theater on Jan. 26. In a cramped Bronx apartment, three generations of Bergers try to figure out what it means to be a Jew and an American, with far-reaching consequences. For director Max Shulman, it’s “a kind of dream” to be able to bring Awake and Sing to the stage. 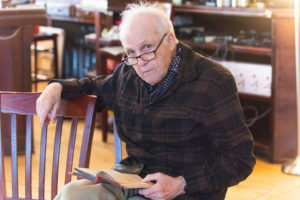 “When I was an undergraduate at Northwestern University, I thought Odets hung the moon and the stars,” he said. The Philadelphia-born Odets was “everything that a quintessential American playwright was supposed to be” — “a poet of the Philly streets,” in Shulman’s words. Shulman, 38, hails from Boston, and was convinced to direct the play by his friend and Quintessence art director Alex Burns. Where in college his interest in the play was buoyed by his desire for gaining a particular role, he finds now that he has a greater appreciation for the totality of the play’s themes. In 2019, he says, it’s more relevant than ever. Lawrence Pressman, 79, playing the role of Jacob, agreed. The play is about the “drama that happens in family units” (which it has in common with “all great dramas,” Pressman said, “in particularly American dramas”), but it’s also about the perils and complex questions that face new immigrants to the United States. The force and honesty with which the play confronts those questions, Pressman said, are what gives it its vitality for the current day. “Whatever your political position today is, you can’t escape the fact that America is going through an identity crisis. Who are we in relationship to what we always were?” Pressman asked. And it’s not simply a political or academic question to him; he remembers his Jewish immigrant grandparents well, and his grandmother once labored in the Triangle Shirtwaist Factory (though she was gone before its infamous fire). The lives of Shulman and Pressman intersect in ways that stretch across decades. Both attended Northwestern, where each discovered Odets and fell in love. Pressman starred as Jacob alongside an actor named Richard Benjamin in a student production of the play. Benjamin, as it turns out, happens to be Shulman’s father-in-law. What better way for a family drama to be produced?